The Good. The Bad. And, The Awesome! So, as usual, I start out with best of intentions to blog each day...and then the show happens. I’ve been up at dawn and not back to my hotel until way past midnight - so the blogging has been minimal. For most of you, I apologize for leaving you hanging regarding Diva. I’ll start there, with an update, in this posting. Bourbon has been in two classes so far. 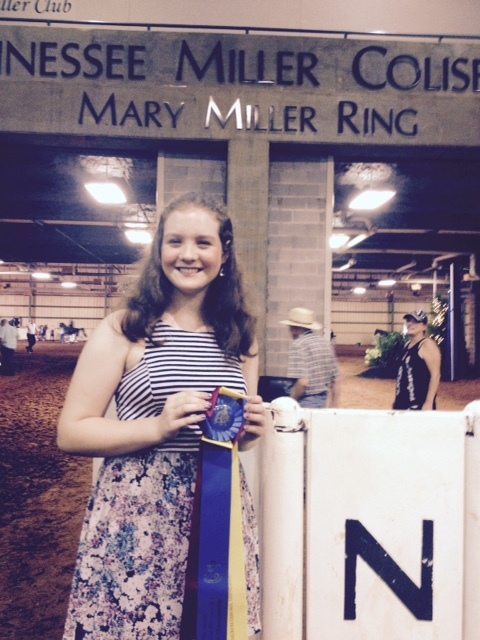 His first was a youth class with Emily Cotten for a 3rd place ribbon on Tuesday night. I didn’t ride him until Thursday, and that big boy pulled out a reserve ribbon in a large class of about 12 or 13 nice horses. He came in second behind a renown World Grand Champion horse, Suiza, and in a class of great contenders! I was tickled pink on his ride!!!! And, he pulled out a great ribbon as well. To celebrate, we jumped in the winners circle and took a photo - and I was joined by Annette & Mike Weber and Mary who were here from Wisconsin, the beautiful trio of Carlan, Emily and Katie Cotten, and my dear friend Tami Steinbrecher. 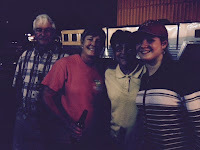 We all went out to the trailer and tipped a few Wisconsin beers in celebration afterwards. Next an update on Halo. He’s on the grounds. Hannah brought him so I could see him, plus to keep him on his training schedule. Ironically, his stall is back to back to Bourbon’s and the two of them keep glancing over the stall walls to meet each other and make friends this week. I think Bourbon looks over the stall wall when he hears me in Halo’s stall - and visa versa. On Wednesday, I trailered Halo over to the vet’s to have a follow up visit. Some X-rays, hoof tests, and walking maneuvers - and the assessment is VERY VERY GOOD NEWS! Couple this news with the experience Hannah has been having from the saddle and everything points to great and awesome news. Now, its all up to the training and our Mr Halo getting the light to come on for his timing. Huge sign of relief...we’re on our way now. There is a big crew from Wisconsin here this year. Many ribbons have been collected - and the youth are getting a huge experience watching and riding at the show. 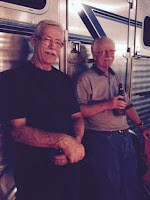 I’ve had so much fun hearing their stories of their rides, and seeing a few of them show. there have been cheers and tears - but everyone is learning and having fun riding in that huge ring. I’ve had to convince Owen to go into a class no matter how many horses go in. And he had a great ride yesterday - securing a reserve/2nd place ribbon ride himself!!! I think he’s more hooked now then ever! The youth are also meeting a few folks - like Connie Waldo, Hannah and Emily - who either have done or will do a Zoom session. They like meeting them in person, and have picked up even more tips and hints on showing and riding while here. They have also shopped at Bedford and seen Nashville. For me, the days have been filled with show prep, show baths, and lots of practicing and socializing. It’s been exhausting but fun and the weather has been hot (over 100 degrees F a few days!). One evening the Hannah Pulvers crew threw a surprise bridal shower for Hannah - who has plans to get married this Fall. It was crazy and fun time. 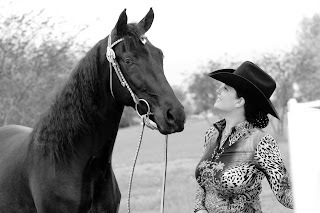 I also had a photo shoot with Diva and Bourbon with Jennifer Barr, who did the shoot of Halo. I can’t wait to see the results. Hopefully will see the proofs today. Unfortunately, I continued a string of bad luck with the trailer tires! In fact a second tire was found flat one morning, and I had to change that one. That provoked Scott to go have me change ALL the tires - just in case. Seems when one tire goes, they all soon follow. So, now I have 5 brand new tires - 4 on the trailer and one spare. I also had to have the truck jumped one night at about midnight. We think it was bad diesel or some air in the line - but via FaceTime Scott was able to walk me and Tami through the processes and we got the truck started successfully. Somehow I have acquired about a million bruises from packing, swinging saddles, and changing tires. War bruises, I guess. I hope that the “bad” is over - and only good stuff like good rides, good health, and fun times lie ahead the rest of this week. I have a few more classes, and potentially will go into a Championship class, before heading home on Sunday. I slept in a bit today, and then had time to write this blog. But, now I think its time to head over to Miller and get back to it. a beer at the trailer. I was up at 7 am, made a Kerig coffee in my room, and headed back to Miller. D and B greeted me with a nicker as I fed them and filled water buckets. I then took a walk to submit my coggins and paperwork in the show office, watched a few horses get early morning workouts in the warmup, and headed back to unpack and set up my space for the week. Now at least I have sunlight, and could see what I was doing as I unpacked, re-orchestrated things inside my tack room, and set up a functional home-base with cross ties, mounting block and chairs and cooler for relaxing. Katie is my best helper ever ! She filled water buckets and cleaned out the horse’s stalls when I removed each to take them to for their shoeing. 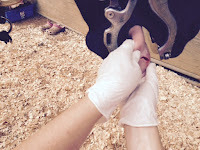 Every year Terry Moran does my horses shoes to perfect show requirements - and this year was no different. By noon we had shiny new hooves, set to perfection. Yeah - this afternoon we can get a practice ride in! moment to pose at Miller. Emily is going to ride B in a youth class this year - so we wanted to make sure to get her a few practice rides before the show. I tacked him up, and walked into the ring. He was a little nervous as he chomped on the bit - but got right to work. It was a bit fast, but he was rolling nice in the footing. I worked him awhile - and then let Emily get on too. This was a good for me - as now I got to watch him go. I never get to SEE him ridden under saddle, since I’m always the one riding. I get some idea when I’m lunging - but this was great to see him being ridden. He continued to be a Speedy Gonzales - but Emily was doing a great job getting a feel from him. And, she was smiling and enjoying him, I could tell. His ears were forward, so I could tell B liked her too. She practiced one-handed for western too - as she’ll have to ride him that way in the class - and did it very proficiently. Okay, CHECK, this will go well - Emily is a great rider. I’m so excited! Next up - Diva. 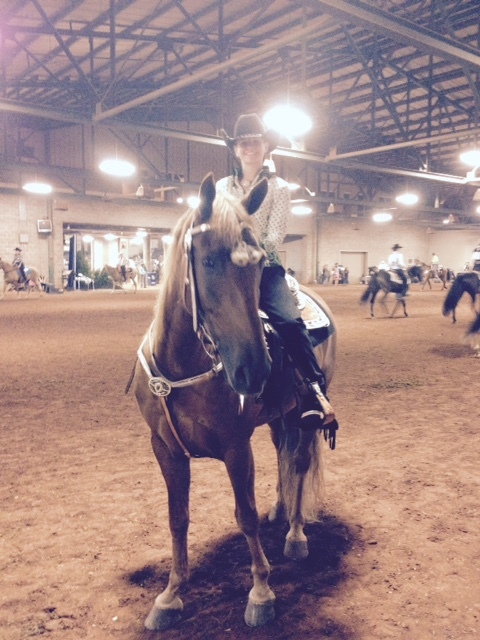 Saddle, bridle and draw reins on - and we were back and riding in the arena. Diva felt a bit stiff, and she too was covering ground quickly. I did a few circles, and then back on the rail. Emily was watching, and I wanted to see what Diva looked like, and asked her to give her a spin too. Again, it was great to see her go - and again Emily did a great job riding. But, I could see Diva was a bit stiff, and nervously speedy. That’s okay, we have a few days before showtime. It was a long ride in the trailer, so I’m sure she’s still recuperating from the trip - I know I am! I rode her one more time around before getting off and heading back to the trailer. I gave her a pat, good girl! Then it happened. It took a split second. A split second that I want back. I want a DO OVER. And it happened in slow motion. But I couldn’t stop it. One moment I was leading her towards the trailer, reins in hand - the next moment her bit and reins were on the ground - the bridle broken right in half when she stepped on the reins that had been pulled right out of my fingers. Nooooooooooooooooooo! I looked at Diva, and she was opening and closing her mouth, as if she was saying, owa owa owa - and sticking her tongue out and rolling it around. I grabbed her by the cavesson, which was all that was left on her head, and saw the blood in her mouth. Nooooooooooooo! I guided her the last few steps to the trailer and slipped on her halter. I then proceeded to try to get a hold of her tongue to see exactly what damage was done. I rinsed out her mouth to remove the blood for a better view. Yikes, it looked like a cut down the middle of her tongue on top and the bottom. Noooooooooooooooo! Okay, who’s the vet on call - Katie sprung to action and ran to the show office for a phone number. I headed to the next aisle and returned with Jana Anderson who took a quick look and reassured me - it isn’t too bad, but get the vet to take a look - we may want stitches. Dr Wright, the on call vet, pulled up and tended to Diva right there. We set up a mini operating room, and she got 5 neatly tied stitches - like a badge of honor - placed down the middle of her tongue. Me, I was the nurse assistant, who held her tongue during the operation. And, we had a whole Wisconsin crew of onlookers. It didn’t take long, and Diva was a very good patient. I was provided with care instructions, antibiotics, and some antiseptic mouth wash to use after her feedings to keep things clean, but only time will tell if I’ll be able to show her this week. All the work, all the time, and a split second freak occurrence and it may be all just a wishful dream this year. I continued to check on her into the evening. I tossed her a bit of hay much later that night and she ate. Slowly. But she ate. She drank as well. But mostly she stood pouting in her stall. I didn’t blame her - and I joined her and pouted a bit too with her as I rubbed her ear, her neck and let a few tears fall. I’m so sorry Diva. I’m so sorry. And she looked at me, and I could tell she liked the pampering - so I gave her more pampering - all that she wanted. Carlan grabbed me and hauled me off for a quick something to eat. I’m glad she did - as I otherwise wouldn’t have eaten anything. I returned to Miller and I hung out well into the dark of night. Katie Livingood stopped by to check on us, and we sat and talked for a while. And Katie held her head to help me apply the antiseptic wash. It was past midnight when I arrived back at my hotel. I think tonight, more exhausted than from the long ride. This is emotional exhaustion now. As I tossed and turned all night - reliving the split seconds over and over - I still can’t figure out exactly what happened. Maybe she stopped or turned to look at something - I really don’t know - but whatever it was pulled those reins from my fingers and just out of reach for me to grab them back before she took her next disastrous step. Cher - if I could turn back time - if I could find a way. Not much left of this tire. I was packed and pulled out of my driveway by 6am heading for my 5th International competition. Driving down Hwy 43 on my way to Tennessee, I heard a horse kick inside the trailer. It was a hard kick - BAMM! - and I glanced in the rearview mirror. Hmmm....wonder if I should check on them? For some reason I reached for the mirror button and tipped the mirror down so I could see the tires and I thought I noticed a bit of smoke or dust blowing on the passenger side of the trailer. When I pulled over to take a look, it wasn’t a horse kick I had heard, but the tire on my horse trailer had completely blown out. Arghhh, less than 90 minutes into my travels and still in Wisconsin...and here my trip came to a screeching halt. Next, I was wielding a tire iron and hydraulic lift in my flip flops and white shorts. (I know!) One quick call with Scott, and I was able to figure out how to get the bolts off, how to remove the spare, and how to get everything put back on. However the spare looked low, so I drove slowly to the Citgo Station only a half mile down the road. Scott caught up with me there - helped put air in the tires and made the decision that I needed a new spare, just in case. A few questions to Siri and I was on my way to Farm & Fleet for a new spare in Rosco. The F&F guys put a new tire on the rim of the blown tire, as well as a new tire on the rim of the spare - but I was the one who had to again change out the tire in the parking lot or wait until noon for an appointment. So tire change #2 was undertaken - and quite proficiently and experienced, I might add. Two hours later, I was back on the road. I made one wrong turn that lost me another hour along the way, but I arrived at dusk around 8:30pm. 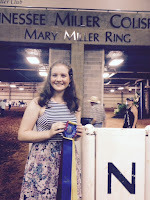 As I drove down the Tennessee Miller fence-lined drive to the arena and horse stall building, Carlan rang to find out where I was ‘cuz she was worried we hadn’t arrived yet. 3 minutes later I saw her waving me in as I pulled up, exhausted at my stalls. 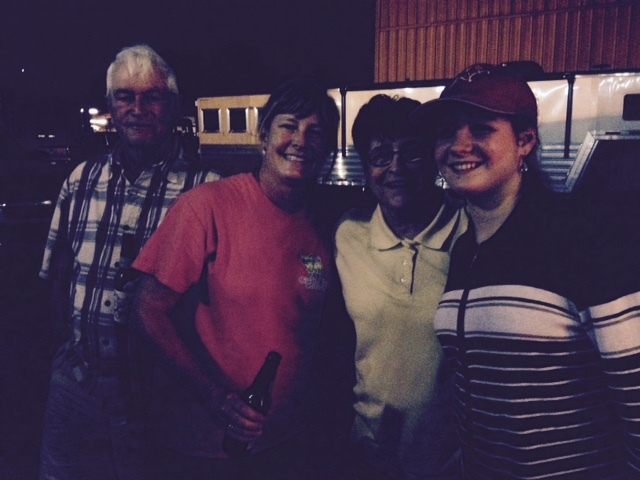 In no time, I had Carlan, Emily, Katie and Peggy Butler all providing an iPhone flashlight and a helping hand. Diva and Bourbon knew we had arrived, and pounded in rhythm inside the trailer. I think it was “let me out, let me out, let me outta here, let me out,” in some kind of horsey morris code - but we all knew the song. 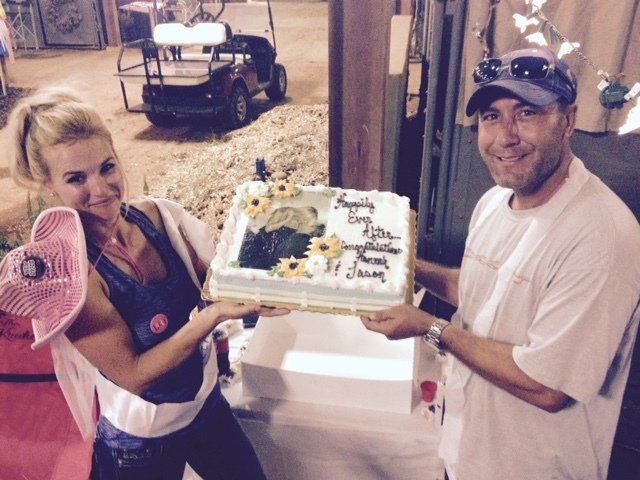 Shavings down, fans installed and blowing, hay tossed, water hung, leg wraps off, and horses tucked in - whew!!!! I hung out only a short a while to see Eileen, Bruce and Owen briefly - then headed for the hotel, to get me showered and tucked in around midnight. The pillow felt so good. I pray tomorrow is a better day! As I prepare for and look forward to the WHOA International at the end of July, I thought it was a good time to bring you up to speed on the happenings this year. 2015 has been an interesting year. By interesting, I mean not quite the year I had planned on having - at least not in the horse realm. And, as many of you know - I'm sorta a big planner (okay, control freak- but who's judging?) Also, I am a firm believer that God works in mysterious ways and that things happen for a reason. So, I continue to be watchful for the lessons and reasons in all that is happening this year. And, I'm learning to embrace the unexpected and ride the tide. Marty Barr from Barr Studios for capturing him on film. The biggest unplanned event has been that HALO continues to be out of the show ring. His fracture has healed completely and successfully, (thank goodness) but we are dealing with getting his hoof angles right so that we can get him timed up and shaking like a champ. Unfortunately that has meant another season down the drain for showing him - as we have made the decision that we want him "perfect," not just good enough. And, it also has meant I have shown him once this year - with the totally tally of twice (ding ding ding) since owning him. Not what the plan was! (LOL, whimper.) However, we have identified the root of our challenge - and we are addressing it - and in only weeks he's made a HUGE rebound. So, I remain hopeful. 'Believe,' has become my single daily word. Lessons: Have a great vet, have a great trainer, and if your horse isn't right - he's telling you something, so stop watch and listen. In addition, tenacity, which is my forte, comes in handy - especially dovetailed seamlessly with belief. Never stop believing. riding shot of B that you captured! With HALO sidelined, my focus for 2015 has turned full-on to Diva and Bourbon. Perhaps, that is where the mysterious ways part comes in. Putting my focus at home, in my backyard, has brought new rewards. First, Bourbon and I have definitely found our sweet spot. We're communicating and working well with each other. He's shaking and going extremely well. Scott says we're better than he's ever seen us ride before. I think it is mostly due to me feeling confident - since we are riding 4-5 times a week, and through that process, we make mistakes, learn, apply and improve. In the end, we are on the same page and communicating. In addition, I have begun to apply what I have learned through Hannah and Bourbon... to Diva. She's getting more off the bit, which has lead to her dropping more in back and raising her head. Perhaps we're only progressing in baby steps, but I can feel a huge difference with his mare from the saddle. She may never be as light in the reins as B - but, she's learning to carry herself more and I think she's happier too. Maybe she likes the learning. I certainly do. Lessons: Apply yourself and never stop learning and trying. Communicate and be consistent and find what works for you as the horse and team. Sweet spots exist for every horse and rider. A few other wonderful events include new, unexpected actions of others. First, I've been riding with Mary and Miranda, two youth riders who live near me. I've been fortunate to be invited by Annette and Mike to ride with their grand daughters which has been fun for me to help them become better riders too. It has also given me a chance to see riding from the ground - not just the saddle - and in the end, I'm learning too. Plus, sharing rides on B, D and Fash with these girls just makes me smile when they smile and think its "awesome." Secondly, I'm over the moon about the number of Wisconsin Walking Horse Associations members who are going to be making the pilgrimage to the WHOA International this year in Tennessee! 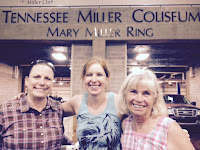 Last year Gale and Eileen joined me to compete in Tennessee. This year there is a whole entourage! Myself, Gale and Eileen - plus Margaret and a number of youth - Tehya, Cordie, Alexis, and Owen! Plus, Mary is coming to sing the National Anthem with Mike and Annette. All in all, with riders, husbands, grooms, grandparents, singers and cheerleaders, we'll have more than a dozen Wisconsinites and 8 horses! We've reserved a full row of stalls and have Wisconsin signage and drapes ready to decorate. Many kudos goes to Gale, who has rallied the troops at her barn and is making it possible for so many of her clients and youth to go. I hope my experience being shared through this blog has put the opportunity out there for others and hopefully in some small way inspired them to give it a try. Much like hearing the stories from Terre, or seeing the success by Kim Leonard (others from Wisconsin who have competed in the TN circuit) has done to inspire me. Lessons: Share. Everyone can inspire someone else. In some cases you may not even realize who or how you are inspiring. But by sharing, you enable it to possibly happen. Then continue to share in what you inspire - and be re-inspired yourself by enjoying everyone else's excitement and enjoyment! So, now the countdown begins. In just three weeks, I'll be loading up and heading again to Murfreesboro, TN - to spend a week of hot competition. 2015 will mark my 5th year competing at the WHOA International. By far, it is the best week of the year. And, this year will certainly bring new and different experiences. I think, perhaps it may be the BEST year yet. Just knowing that we will have the company of a great group of people from Wisconsin has put new momentum and excitement into this trip. It certainly will bring a unique and energetic support structure - and will sure to be a fun and exciting adventure! To everyone getting ready for International: You are about to have the best experience of your lifetime! I can't wait to enjoy it all with you! Good luck and remember to have fun-fun-fun!